With the impending publication of Andorra Pett on Mars, I wanted to look back at what must be the most unlikely event, a sequel to a book that I never thought I would write. 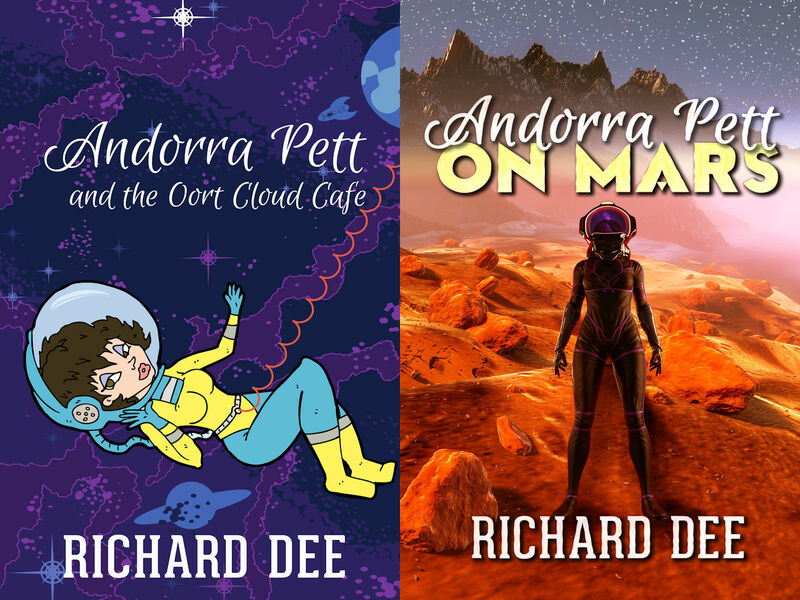 Andorra Pett and the Oort Cloud Café had a bit of everything that I considered myself unable to do, a female lead character, humour, innuendo, crime. It has a base in sci-fi, which is about all I originally felt able to contribute. Yet it has been given good reviews, people have enjoyed it and now it’s almost time to see if the sequel is as well received. Andorra Pett was originally conceived as the result of a bet, she was never intended to be more than a short story. Now her exploits have acquired a life of their own, her chaotic attempts at crime fighting are developing into a series. 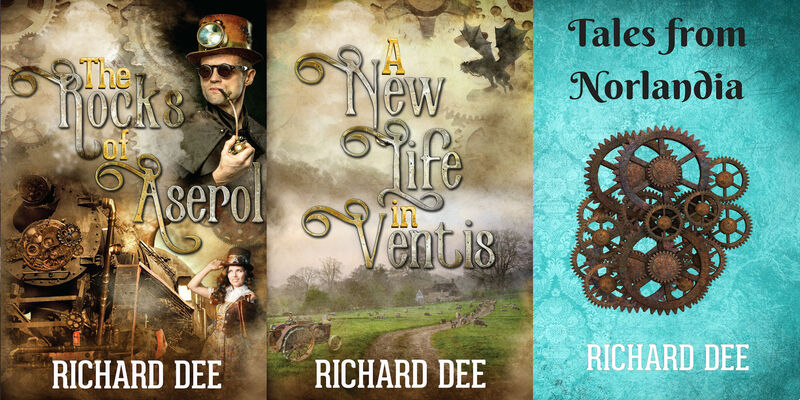 Before I tell you more about that, I must also confess that I never intended to write series, just as I never intended to write sequels, prequels and spin-offs. I wanted to write all sorts of different, unconnected stuff. It just developed, almost organically. People read the novels and ask me what happened next. They ask for explanations of parts of the stories. Not only that, sometimes, as an author, you can see a divergent path whilst you are writing and must choose to pursue one route instead of the other. I store all these alternatives and requests in my head and bring them out when I’m feeling stuck for ideas. The problem is that they push the ideas for new projects aside. As I’m inherently lazy, I find it easier to write another Dave Travise story, for instance, than to develop a whole new universe for a different idea. In the same way, it’s easier to spin off sideways, to write about other events taking place in the same universe. You have your basics in place, it’s just a case of fleshing out your plot. 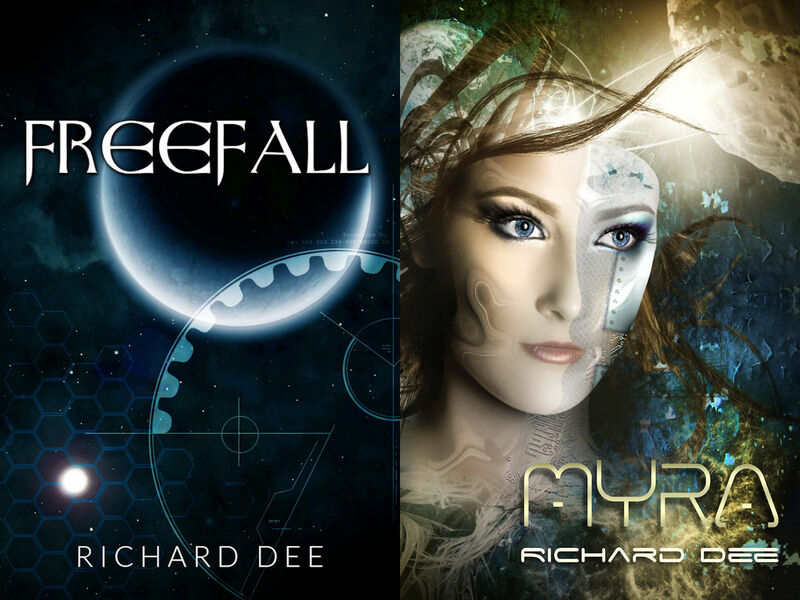 and three future worlds, all with linked characters and situations. Although I’ve tried to make all the stories stand-alone, so they don’t need to be read in order, they are inevitably connected. And I have ideas for more instalments of all of them, in both directions and sideways too. As I’ve said, they will be made up from a combination of readers’ comments, as well as being inspired by some of the research and backstory that I’ve created as I’ve plotted. But of course, when it comes to series, I’m a mere beginner. Take Andorra Pett, as she’s the focus of this post. She originally came from someone suggesting a sci-fi story about a person who was running away from a bad relationship. The idea was that she went to do something completely out of her comfort zone. Like so many books with that premise set on Earth, usually in Cornwall or Devon. Originally, Andorra was a short story, at the insistence of my editor and others it became a novel. As I came to know Andorra and her world in more detail, I had an idea for a sequel, prompted by a piece of backstory. From that, I’ve also got two more books in planning and I suspect that there could be many others. Could I write more, is it possible for me to keep on thinking up scenarios for Andorra to investigate? Well, let’s look at a couple of other amateur detectives, both of who inspired Andorra and feature in long-running series. Agatha Raisin features in 28 books and three short stories and she lives in a small village in the Cotswolds. Miss Marple had 12 books and 20 short stories. She also lived in a small village. In both cases, the opportunity for going to different locations was limited, most of the crimes in those series happen close to home. And yet the authors managed to carry on writing lots of original stories. Andorra Pett, by contrast, lives on a space station in orbit around Saturn. In her time, Mars is colonised as well, which means that I can devise all sorts of places for her to explore. And I’m sure that the art of murder, or at least crime that needs solving will be carried along with our exploration of the Galaxy. There will always be a place for an amateur detective, perhaps more so on the fringes of civilisation. Especially as the dangerous nature of the place makes it casual death more likely. And that suggests opportunity, it could be a lot easier to get away with murder in space. So, what’s next for Andorra? 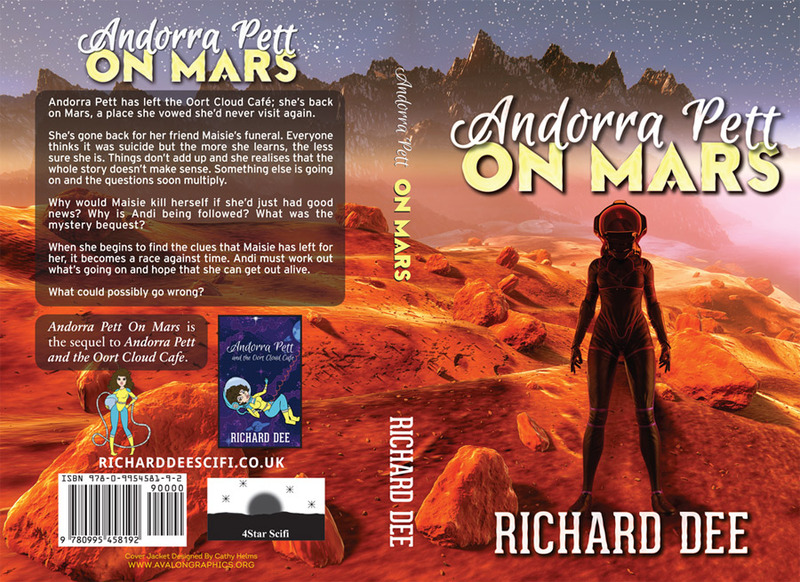 After her adventures on Mars, she will be returning to Earth for the third book, Andorra Pett and her Sister. Chapter one of that story can be found at the end of Andorra Pett on Mars. Then, in the fourth story, currently titled Andorra Pett takes a Break, she decided to treat herself to a holiday, the trouble is, nobody has told the bad guys that she wants a couple of months peace. Where can we go from there? I want her to have more adventures, I guess that the future gives us a lot of possibilities, Andorra could get invited to join the first ship to leave the solar system, set up a new colony on a newly discovered planet that’s light years away, or maybe return to the scene of one of her old adventures for another story. There are plenty of options for mystery and mayhem involving Andorra, and that’s before we even consider the other characters in her world. Such as her sidekick, Cy. He could be worth a story or two on his own, especially if the two of them are forced to be apart for some reason. Her romantic interest Derek has a family as well, all with their own pasts, never forgetting that there is always the chance that Andorra could have children of her own. There could be a dynasty of clumsy but lovable amateur detectives running around remembering how Grandma solved the mystery of whatever. As I’ve been typing this I realised, that was all very well but all moving forward in time. Aren’t we forgetting what happened to Andorra before the series started? There must be some interesting stories from her formative years, if only we could find someone to tell us about them. As I think you can see, once you get started, there really is no limit, except time itself and the speed that you can type the words. As long as I keep thinking up adventures for her, Andorra can continue to have them. Next week, I’m going to tell you about a job I once had. I really enjoyed Andorra Pett and the Oort Coud Café,both interesting and quirky and I look forward to her further exploits as soon as the new ebook version is available. I’m not entirely sure that I want to involve myself in her earlier ‘pre Ucky Strike’ life in the form of prequels, but am looking forward to reading more of her exploits as the adventurous and versatile woman she’s grown to be. All the best to you and Andorra! Thanks for commenting, I’m glad you enjoyed the story. Could I please ask you to leave a review on Amazon for Andorra Pett, it would be appreciated and help my sales ranking.